Today marks Day 5 of my newest vacation on Ward 5 with all my patient pals .. and discharge has not even been mentioned. Truth be told .. this is a good thing. The plan which currently stands is I will be discharged with either a) a bowel that functions with whatever medicine that encourages it to work, or b) a surgery date. Meaning when I leave the hospital there is going to be light at the end of this tunnel. A resolution. Please take careful note of my fashionable fruit bowl! The week has consisted of attempting to get my colon working with high dose laxatives in order to begin a new medication (many of the surgical doctors don’t even know what this medicine is – crazy). After 3 days of this medicine (16th March) we finally got things moving (TMI – sorry). 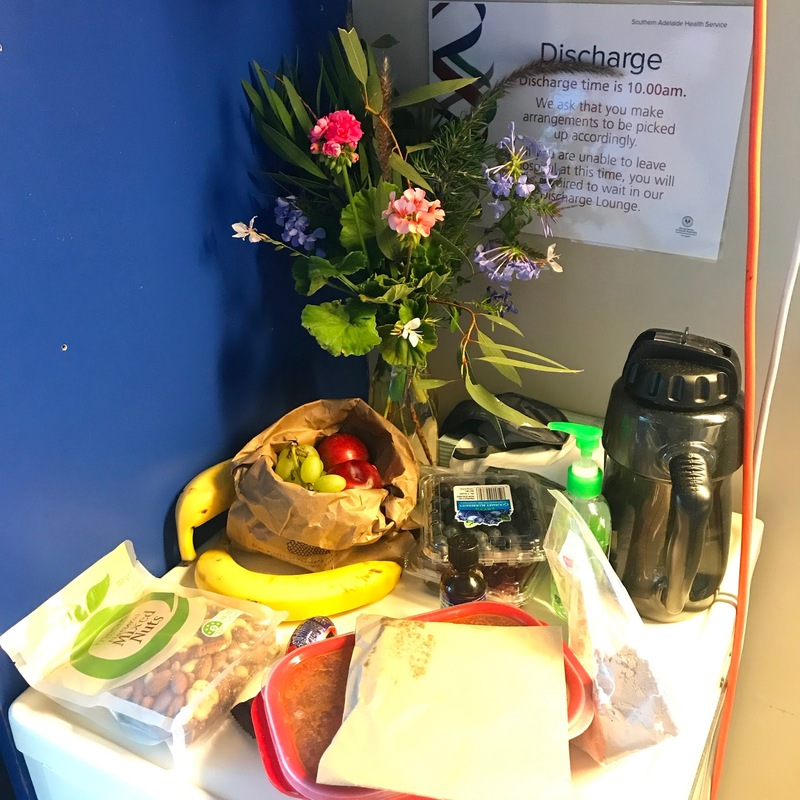 All of the specialists were surprised how long it has taken to get my bowel moving this time around .. it seems the longer this goes on the less the trusty bowel preparation works. But we got there.. 4 sachets later. My doctor said to me during the wait of the bowel movement ‘there is literally nothing else I can give you as nothing else works for you’… GOOD that’s what you want to hear! Good ol’ colon functioning to its optimum. My doctor organised for approval of another medicine. This medicine is similar to the previous one that I have tried; however, works more as cream for your colon to pamper it, give it a bit of loving in order to get it functioning. Please cross your fingers and toes for me. I will be taking this with 1L of medicine which is a bowel preparation medicine (the one which gave me a bowel obstruction) in the hope the two of them will support the peristalsis of my colon. Here’s hoping! ANYWAY… so last night I took the new meds (17th March). The side effects are nowhere near as bad as previous medicine but I have still felt a little weird and wonderful. Nausea has been through the roof and because of my condition I am only allowed one type of nausea medication which does not impact constipation further. Needless to say .. this particular medicine does nothing for me and I have felt horrendously nauseous. I didn’t eat dinner and then when I thought I was going to get a good sleep my blood pressure dropped. My blood pressure has been stable throughout my stay so far (Usually 120); however, it dropped to 92 overnight. So what was meant to be a peaceful night with only one wake for blood pressure check I had them HOURLY! By the time I got back to sleep.. I was being woken up again. BLOODY SPENDID!. At 4am it had dropped again to 90 so the doctor came and did an entire body check to ensure I wasn’t going to pass out. I felt okay I just had a tight chest and was nauseous. Everyone was concerned it was a side effect of the medicine so the checks continued on throughout the morning. My specialist came past and was worried I was really dehydrated so gave me enough liquid to fill an empty reservoir. AND HERE I AM. 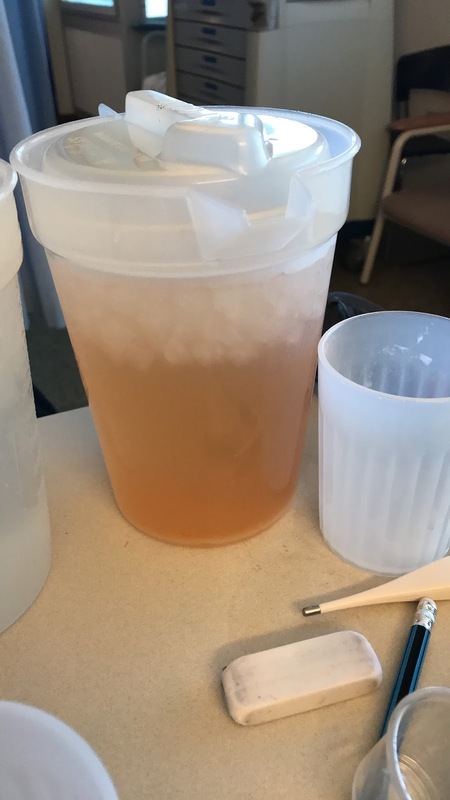 Slurping my water and my urine looking medicine (see picture below) having a jolly good weekend in the hospital with all my fellow bowel problem pals.